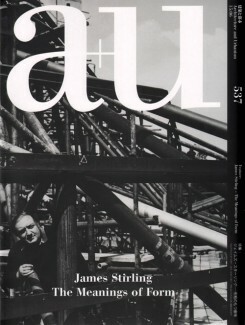 A special feature on British architect James Stirling weaves an in-depth and appreciative portrait of a man many consider to be one of the most important architects of the 20th century’s second half. Tom Heneghan collaborated in this presentation of three university projects from Stirling’s early career (Leicester, Cambridge, Oxford) and three later museums (Stuttgart State Gallery, Clore Gallery, Nordrhein-Westfalen Museum). Perhaps difficult to grasp at first, with some knowledge of architectural history and culture the architect’s work opens up its rich context and humour. Besides many photos and drawings, it features essays by Heneghan and Peter Cook. Tokyo, 2015, 22 x 30 cm, 136 pages, illustrated, paperback.